The Memorial Idea began in the cemetery. The establishment of a memorial identity for each person who lived and died was the most important part of the rite of passage called death. Cremationists quickly adopted the idea to include cremation, but the obstacles they faced were harder to overcome than those of their cemeterian counterparts. Cremation urns have been utilized in one form or fashion since the dawn of civilization. Greeks placed their dead in urns of various materials most often terracotta. The Romans placed their dead in urns of semi-precious stone deposited in columbaria. After cremation’s modern revival began in the U.S., urns still were not uniform in size or composition. By the early 1900s, urns of various metals, including copper and tin, were frequently used. In the 1920s, as cremation began to stabilize, bronze urns became the norm. 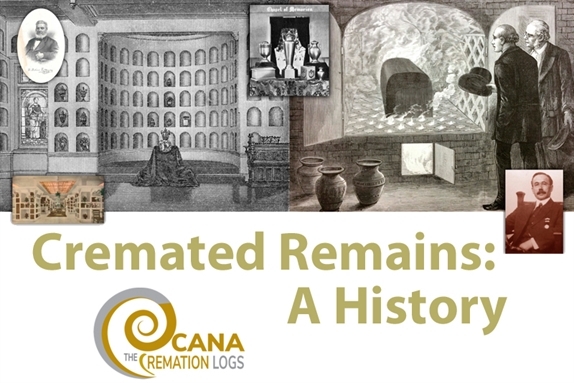 For many years, the urn memorial was so important to cremationists that CANA’s logo, as the Cremation Association of America (CAA), featured illustrations of an urn in a niche. When a bronze urn was engraved indelibly with a person’s name and dates of birth and death, the urn became part of the memorial. Together with the other urns in a columbarium, they lent their beauty to add to the overall experience of a columbarium. Just as every person who lives must die, so too should every person who dies have a permanent resting place. Just as the ancients inscribed names on the urns of their loved ones, the ancient Greeks erected Tumuli in memory of their dead, the Egyptians erected the pyramids, the Romans inurned in columbaria, Kings and Queens entombed in Westminster Abbey, so the placement of the urn became the permanent memorial that cremationists required. This was the utmost concern of the cremationists who were active in the Cremation Association. 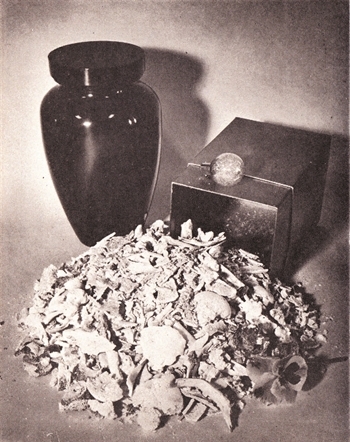 The inurnment of cremated remains was not always a priority for cremationists, but became the sole purpose of the plight of the association beginning in the late 1920s. Scattering cremated remains, permanent destruction of cremated remains, and home retention of cremated remains were all in direct conflict with the Memorial Idea. Often, the practice was equated with desecration and was fervently discouraged. The conventions of the Cremation Association were breeding grounds to further the Memorial Idea to those who chose cremation. Lawrence Moore, long-time president and operator of the Chapel of the Chimes in California, was the most instrumental character in the cremation world – he coined the word “inurnment,” invented the first electric-powered cremator, and began the practice of including a unique metallic disc used in every cremation to identify cremated remains. He also was the first to suggest using a cardboard temporary urn to encourage the selection of a permanent urn. Throughout the meetings of the Cremation Association, there were frequent discussions about standardizing the practices of crematories across the country. Many ideas were exchanged on how this could be effected to encompass the cremation customs from the east coast to the west coast and the mix of both in the Midwest. A committee was formed and, after much research, in 1941 the Manual of Standard Crematory and Columbarium Practices was adopted. This manual was considered the textbook of the operations of the modern crematory and columbarium, and became the bible by which cremationists promulgated the Memorial Idea. 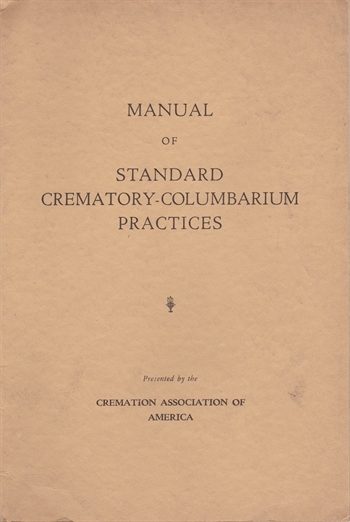 Throughout the manual, sections dealt with all aspects of operating a crematory and columbarium, but the sections that discussed the handling of cremated remains and the permanent placement of memorial urns were the most doctrinal in nature. During the Memorial Idea era of cremation’s history, most cremationists refused to pulverize, crush or grind cremated remains to reduce their consistency to the cremated remains we picture today. It was the belief that the reduction of the remains to the finer consistency was a desecration to the remains and gave the impression of valueless ash. Their stance also enforced the need for a permanent urn and to aide in the prevention of scattering. This is very important. We have no right to crush, grind or pulverize human bone fragments. They should be placed in the temporary container or urn, just as they were removed from the cremation vault… To do otherwise encourages desecration, gives an impression of valueless ash, and will eventually destroy the memorial idea. There is usually sentiment for the cremated remains of a loved one, but it frequently disappears when desecrated. All crematories should adopt this same policy, so the practices are the same everywhere. Cremated remains are human remains and are deserving of careful and reverent handling. The attitude of the individual toward cremated remains is oft-times represented by the way he handles them, and the attitude of the crematory-columbarium is definitely expressed by the way remains are prepared and handled by its employees… How can we expect a family or interested party to recognize the fact that cremated remains are human remains and are deserving of proper memorialization if, as crematory-columbarium operators we fail to express by action as well as by word and thought that the remains are sacred? Cremation’s transformation began in the 1960s. Although influenced by many factors, this change was primarily due to a movement toward simplicity. It was in 1963 that Jessica Mitford wrote her satirical expose, The American Way of Death, lambasting all aspects of the allied funeral and memorial professions. Urged by the excitement that her book spawned, businesses formed to advocate for simple direct cremation and provided easy avenues for those preferring minimal services. The Memorial Idea began to lose hold, and, as it did, the Cremation Association of North America (CANA), led by Genevieve “Jinger” Zell, daughter-in-law of Clifford Zell, Sr., mentioned above, did everything possible to maintain the integrity of what CANA viewed was right: the permanent memorialization of cremated remains. National ad campaigns were initiated and the association’s trade magazine began publication in 1965 to disseminate the news and advocacy of the association. The simplification process that cremation underwent was underscored by the general public’s idea of death care practices. However, this movement did not only affect the memorialization side of cremation – all areas were affected. Cremation chambers were manufactured to ship to different locations, where they had been previously constructed on-site. The first modern crematories were constructed in the basements and wings of chapels across the country, but soon were moved from chapels to garages and metal out-buildings. During the transformation, scattering cremated remains became more and more popular. Crematories installed “cremulators” and processors to reduce the consistency of the cremated remains in order to facilitate cremation. Did scattering encourage processing or, as was the fear of Lawrence Moore in the Memorial Idea period, did processing encourage scattering? The answer is unknown. However, it is clear that the two went hand-in-hand during this time. With the focus of cremation changing from disposition and memorialization to cost-conscious simplicity, the cremation urn industry changed as well. While a majority of urns sold during the time of the memorial idea were constructed of fine cast or spun bronze, aluminum and wood now became popular options. 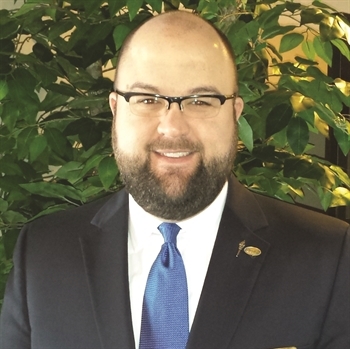 Through all the changes that the cremation profession has faced over the years, the constant underlying ability to succeed amidst the challenges of doing business has proved stronger with membership in the Cremation Association of North America. Since its inception, the association has maintained cremation as its theme, and no other professional association has the roots, track record, singular focus, or knowledge that ours does. All of this has been gained by experience and by maintaining the ability to adapt to the needs and desires of those our members serve. What does the future hold for cremationists? That is entirely dependent on the attitude of the cremationist. If we simply measure how far our profession has come in the years since America’s first modern cremation in 1876, and review how CANA has guided this profession for more than a century since its formation in 1913, we will quickly realize that our true potential lies ahead. In reading the proceedings of almost 40-years-worth of annual conventions of the Cremation Association, I have learned some very important lessons that I can use in my daily dealings with families choosing cremation. Paper dissolves, computers crash, but when a name is engraved on a permanent memorial urn made of material that will last, or on a stone marking a place of rest, these permanent, tangible signs provide stepping stones for future generations. May we never lose sight of the ever-present necessity of our association and our calling, and may we never fail to put families and their needs and desires ahead of our own. We must do all that we can do to maintain the heritage of our ever-changing culture. To do so is to fully serve those who call on us in times of need. It is, after all, what our life’s work is all about. This post is the second in our series on the history of cremation in preparation for the opening of The History of Cremation exhibition at the National Museum of Funeral History. Catch up with the first article and the women who contributed to cremation and CANA. Learn more about the exhibit and how you can contribute on the museum’s website. Update! One hundred years of conventions proves that CANA successfully tackles the topic of cremation by continually providing relevant, progressive content. The 2018 convention was no exception. Weren't able to join us? You can access Jason's presentation recording and all other speakers' wisdom on our Learning Management System. View session descriptions and pricing here: gocana.org/CANA18. Excerpted from The Cremationist, Vol 49, Issue 3: “Memorialization: The Memorial Idea” and Vol 49, Issue 4: “Simplification: The Cremation Movement Since the 1960s” by CANA Historian Jason Engler in honor of CANA’s Centennial celebrated in 2013. All photos from the Engler Cremation Collection, courtesy of the author.